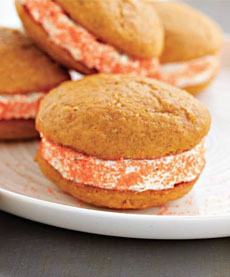 Pumpkin whoopie pies. Photo courtesy Kraft. 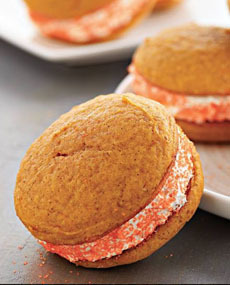 As a Halloween- and Thanksgiving-season treat, bake a batch of these whoopie pies. The recipe below, from Kraft, consists of a pumpkin cake “sandwich? filled with ginger-cinnamon cream. The glamor comes from rolling the cream edges in seasonally themed sprinkles like these (or for an edgy whoopie pie, these skull sprinkles). For Thanksgiving, try these pretty fall leaves sprinkles or these autumn mix sprinkles. The cakes can be made ahead of time, baked and frozen for up to 2 weeks. When freezing, place in single layer in pan to prevent them from sticking together. Thaw completely before using them to assemble the whoopie pies. 2. BEAT first 7 ingredients with mixer until well blended. Spray a baking sheet with cooking spray. Scoop into 32 mounds, using about 2 tablespoons for each on the sheet, placing them 3 inches apart. You can use a small ice cream scoop to quickly portion the scoops of dough onto the baking sheet. 3. BAKE 12 to 14 minutes or until toothpick inserted in centers comes out clean. Cool on baking sheet 2 minutes. Remove to wire racks; cool completely. 4. BEAT cream cheese, marshmallow cream, ginger and cinnamon in large bowl with mixer until well blended. Whisk in whipped topping. Spread 3 tablespoons onto flat side of 1 cake; top with second cake, flat-side down. Roll edge in sprinkles. Repeat with remaining cakes. Keep refrigerated. Another season, another reason, for making whoopies. Photo courtesy Kraft. A whoopie pie is technically a sandwich cookie, but the cookies have a cake consistency. Yet it’s called neither cookie nor cake, but pie. Clearly, a whoopie is no pie: A pie comprises a pastry crust with a filling. Yet a Boston Creme Pie is two layers of sponge cake filled with vanilla custard and glazed with chocolate. A cheesecake contains no cake; it’s a cheese custard pie. Misnomers exist. According to food historians, these Amish-baked desserts, possibly made from leftover cake batter, where originally known as hucklebucks, or creamy turtles. As the legend goes, one farmer who opened his lunch pail to find the treat shouted “Whoopie!” and the name stuck. Whoopies are made in many flavor these days, but the original consisted of two wee chocolate cake “layers” with a creamy vanilla frosting between them. Maine, New Hampshire and Pennsylvania all claim to be the birthplace of the whoopie pie. The Pennsylvania Dutch Convention & Visitors Bureau claims that the dessert originated with the Lancaster County Amish and Pennsylvania Dutch. While there are no dated, hand-written or printed records from Pennsylvania, Labadie’s Bakery in Lewiston, Maine has been making whoopie pies since 1925. The now-defunct Berwick Cake Company of Roxbury, Massachusetts began baking them in 1931.